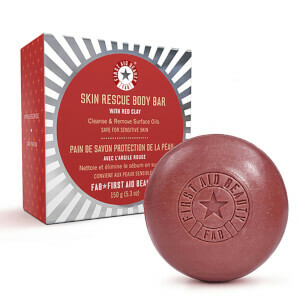 Catering specifically for acne-prone or oily skin, the First Aid Beauty Skin Rescue Body Bar eliminates impurities from top to toe without over-drying or irritation. Fortified with purifying Red Clay, the body bar creates a luxurious lather upon contact with water to banish dirt, oil and pore-clogging debris, whilst Rosemary Leaf Oil delivers astringent properties to minimise body breakouts. Moisturising Glycerin provides superior hydration so you can experience refreshed, revitalised skin with an invigorating herbal fragrance. With a soft cloth, loofah or hands, apply bar soap to skin. Rinse completely with water. Use daily as needed. Not for the face.